In an e-mail addressed to Chin and shared with the Globe, Ronald Desrosiers, the former director of the primate center, objected to the idea that the center’s problems stem from past leadership. He said that the majority of the issues have occurred after the medical school leadership intervened in the primate center. “Except for the 2010 cage washer incident, NEPRC had an absolutely stellar record... during my 12 years of leadership and we were the model of what an animal research institution should be. Whatever relatively minor issues there were in 2011, they could have and would have been adequately taken care of by the experienced leadership that was in place," Desrosiers wrote. "The recent transgressions since my departure in September of 2011 have nothing to do with the previous leadership." The NIH Primate Center Directors seem to be a particularly unsavory sort. The previous director of the Wisconsin NIH National Primate Research Center, Joe Kemnitz, has been caught lying to the public and to reporters -- even student reporters -- so very many times that lying must be his primary mode of communication. And his predecessor, John Hearn, wasn't anyone you would want your daughter dating. Just prior to him skipping town and hiding out in Switzerland, it was discovered that he had run up a giant phone bill for the university while harassing a female employee whom he worried would call attention to his violent behavior. This was about the same time it was discovered that he and the rest of the staff had been secretly taking monkeys from the Vilas Zoo and selling them and using them in their own horrible and deadly experiments in violation of eight years of multiple written promises to the County that they wouldn't do just that. What a crew. And these are the leaders, the top dogs, the very best of this nasty cruel unethical pack of tax-dollar-sucking vampires. Harvard University's New England National Primate Research Center's long-time director, Ronald C. Desrosiers, as well as an associate director, the attending veterinarian, and a clinical veterinarian have all been fired or forced to resign following the public disclosure of repeated violations of the Animal Welfare Act. The culling is probably a result of the repeated complaints from SAEN, an antivivisection watchdog group headed by Michael Budkie. Such sweeping house cleaning is unprecedented. The staff at the other NIH National Primate Research Centers must be losing sleep as they think about the coverups and animal care problems rife in their own facilities. "We all operate in the same way." -- Joseph Kemnitz, then acting-director of the National Institutes of Health-sponsored Wisconsin Regional Primate Research Center, at the University of Wisconsin, Madison in a comment he made concerning the entire NIH Primate Research Center System on March 1998 in The Progressive. A friend whose opinion I value, wrote to me and said that after reading my post, UW Issues Misleading Press Release a couple of times, that he didn't get my point. He suggested that a better, easier-for-the-public-to-understand title might have been something along the lines of: "UW Vivisectors Mistreat Monkeys to Prove What We Already Know." He makes a good point. I forget sometimes that most readers haven't read every word I've written and haven't attended every talk I've given (though a few actually have!) As a result, many readers may not know how often and regularly vivisectors and the institutions that harbor them mislead the public. The suggested title, "UW Vivisectors Mistreat Monkeys to Prove What We Already Know," would have reflected my fundamental motivation for calling attention to the UW's press release, and I should have been more explicit about how the monkeys were used. Body Weight Impact on Puberty: Effects of High-Calorie Diet on Puberty Onset in Female Rhesus Monkeys. Terasawa E, Kurian JR, Keen KL, Shiel NA, Colman RJ, Capuano SV. Endocrinology. 2012. Unlike much of Terasawa's other research, where she keeps monkeys restrained for hours on end and pumps various chemicals into their brains, this study was much less grueling for the monkeys she used. The eight monkeys were pair housed when they were 10 months old and separated with a sliding mesh panel while they ate. One monkey was then fed a high calorie diet while the other one was fed the standard lab diet. They had weekly blood draws, but the method used wasn't described. Two methods are common -- either "knocking down" monkeys with ketamine, or else pressing the monkeys tightly against the front of the cage with a "squeeze-back" cage mechanism. They had physical examinations every month, and again the method of controlling them wasn't described, but a ketamine injection while being physically restrained is likely. Precocious menarche (their first menstrual period) was seen in the high calorie monkeys when they were between approximately 18 and 21 months old. At that point both of the moneys in the pair were killed. Their brains and various tissues were saved "for later analysis." Comparatively, these eight young monkeys weren't treated so badly. They weren't intentionally infected with a deadly disease, didn't have their eyes mutilated, didn't their brains burned with acid, weren't intentionally frightened, and weren't kept in solitary confinement. They were relatively lucky compared to most of the 2000 monkeys at UW-Madison who do have the things listed above done to them. The press release that accompanied the publication of this paper was written by the UW-Madison Public Relations specialist, Jordana Lenon. She has a long history of making things up and spinning the truth about what goes on at the primate center, which is to be expected. Her job is the production of propaganda. In this case, she claimed that Terasawa's "discovery" that monkeys on a high calorie diet reach puberty before monkeys on a "normal" diet will help human children. But this, as my friend suggested with the better title, is something that has been increasingly talked and written about. Fortunately, few public health agencies have been waiting on a study in monkeys to start advising parents to control their children's weight. See for instance: "Healthy Weight - it's not a diet, it's a lifestyle!" A trend for earlier timing of menarche in several countries has been documented for the period from the mid-1800s to the mid-1900s and presumably is related to improved health and nutrition. It has been established that overweight girls tend to mature earlier than lean girls. Their conclusion begs the question of whether results from monkeys will mean much of anything for human girls, white or black. The Terasawa study, hyped by the university and then reported on by a number of media outlets, had nothing new to report, relative to human health. The eight monkeys were used and killed only to satisfy vivisectors' curiosity. The fact that these monkeys' deaths were approved ahead of time by an oversight committee is evidence that even the most trivial of reasons are deemed adequate justification for using and killing monkeys in university labs. The subsequent PR hyping by the primate center propagandist is evidence that any experiment, no matter how worthless, is later claimed to be life-saving, and in this case, will probably lead to the prevention of diabetes, obesity, cancer, and heart disease! So, I hope I have explained here my visceral reaction to the press release from the university ballyhooing this cruel worthless use of animals whose minds and emotions are so much like our own. Ei Terasawa's experiments have a long history and are clearly cruel. The USDA caught her violating her approved protocols. Her animal use was suspended by the university as a result. See the 2004 letter to her from the UW grad School ACUC here. Briefly, in compliance with her UW-approved protocols, she was keeping female monkeys in restraint chairs, sometimes for days, and using a technique called a push-pull perfusion to "push" anyone of very many chemicals deep into the monkeys' brains, and to "pull"out the chemicals that resulted after the cells were exposed to them. This was done repeatedly to the monkeys she was using. Her approved protocol required constant observation by a technician. In the case that was discovered by a USDA inspector, the technician had taken a lunch break and the container holding the artificial cerebrospinal fluid that was being used as a medium to deliver the chemicals to the monkey's brain, went dry. Apparently, air was being pumped into the monkey's brain and she died. She was an elderly monkey who had undoubtedly endured a lifetime of privation and torment. Here's an internal report on some of the problems in Terasawa's lab. Her "privileges" were reinstated, but the committee -- the same committee that had been repeatedly approving her methods for seventeen years -- decided that she could no longer use her preferred push-pull procedure, and she would have to use something quite similar but with a less disturbing name, called micro dialysis, which she continues to use. Immediately after the guide cannula placement, the monkey was removed from the stereotaxic apparatus and placed in a primate chair. The inner stylet was then removed and a microdialysis probe ... was inserted into the guide cannula so that the tip of the probe was located in the S-ME ... Central nervous system perfusion fluid ... was infused through the influx tubing .... Dialysates were collected... Experiments were conducted for up to 12 h, during which the animal was provided monkey chow, fresh fruit, other snacks, and water, and allowed in close proximity to a partner monkey for visualization and vocalization. After the experiments, monkeys were returned to their home cage for at least 1 month before participating in a subsequent microdialysis experiment. S-ME is shorthand for stalk median eminence, the small strand of brain tissue that connects the pituitary gland to the brain. 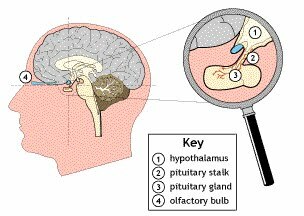 The pituitary gland rests in a small pocket of bone. In other words, she's pushing a metal tube from the top of their head all the way to the very deepest recess of their brain. This image may give you an idea of the gland's location. Monkeys undergo this procedure many times. "... over 1,200 people acquired infections from BSL-4 labs"
How secure are labs handling world's deadliest pathogens? .... "We are now in a proliferation race for BSL-3 and 4 labs," said Laurie Garrett, the senior fellow for global health at the Council on Foreign Relations in New York. "Having such a facility is a mark of national sophistication. But the spread of these labs allows the unfettered proliferation of the world's most dangerous microbes." Indeed, deadly microbes have escaped high-security labs. Between 1978 and 1999, just over 1,200 people acquired infections from BSL-4 labs around the world; 22 were fatal. Since then, lab workers have been killed by Ebola and SARS, or severe acquired respiratory syndrome. Thieves tried to steal animal pathogens from an Indonesian lab in 2007, the NRC workshop was told. Now that laboratory studies have yielded a glimpse of H5N1 flu viruses that might spread rapidly in humans and cause a devastating pandemic, vaccine makers will be better prepared if one develops. Or will they? Increasing rates of childhood obesity may be responsible for a dramatic increase in early-onset puberty in girls, new research suggests. Obese girls, defined as at least 10 kilograms (22 pounds) overweight, had an 80% chance of developing breasts before their ninth birthday and starting menstruation before age 12 - the western average for menstruation is about 12.7 years. Early-onset puberty could have serious health and social consequences, experts say, including increased incidence of teenage depression and of cancer in later life. (PressZoom) - MADISON - Environmental pollutants, eating habits, lack of exercise and genetic traits have all been raised as possible causes of earlier puberty onset in girls in recent years. Now we may now know why: It's the calories, as reported by Ei Terasawa, Joe Kurian, Ricki Colman and colleagues at the Wisconsin National Primate Research Center at the University of Wisconsin-Madison. Their findings, the first to document a connection between diet, growth and puberty in nonhuman primates, appear today in the journal Endocrinology. Armed with the knowledge that human societies in developed countries are trending toward a declining age at menarche, the team fed a group of preteen (12-month-old) female rhesus monkeys with either increased calories or a control diet. "We found that increased caloric intake accelerated body growth and puberty onset, with consistently elevated levels of the hormones leptin and IGF-1," says Terasawa, a professor of pediatrics in the School of Medicine and Public Health who has studied puberty in rhesus macaques at the Primate Center since the 1970s. " These hormones are associated with fat and with bone and muscle growth, respectively." Kurian, a research associate at the center, adds that the animals eating more and reaching puberty earlier were not obese, but they did grow faster and larger than their age-matched controls. Colman points out that, because puberty timing in humans is also influenced by other factors such as genetic traits, living conditions, geographical location and environmental chemicals, it is difficult to distinguish the effect of diet and body size from other factors on puberty in a human population. "In our rhesus monkeys, whose reproduction and development are closely matched to humans - but with the monkeys growing up faster - we could better control all other factors and were finally able to determine a single factor that affects early puberty onset," says Colman, a senior scientist with a nutritional background who also heads the well-publicized caloric restriction and aging studies at the center. Before beginning the study, the researchers had noticed from carefully kept center records over the past 30 years that colony females were growing up faster and seemed to reach menarche at an earlier age. During this period, caloric intake in colony animals likely increased, as the animal care staff was introducing more fruit and other treats for foraging activities, snacks and training. So the scientists decided to create controlled experiments based on these observations. Four juvenile females were fed a normal calorie diet, while another four ate an excessive amount of calories. Six to seven months later, all four overfed monkeys exhibited menarche, which should have begun 12 to 14 months later. The findings suggest the increased importance of closely monitoring children's eating behaviors and intervening as necessary to reduce the prevalence of precocious development and metabolic diseases in adulthood. Such diseases include type II diabetes, obesity, cancer, heart disease and metabolic syndrome, Kurian says. The average age that girls begin menstruating has declined over the past 150 years by four years, Terasawa says. "This can be very traumatic physically and psychologically to a young girl who is already showing signs of being a woman at age 8 rather than age 12," Terasawa says. The research not only shines a stark light on why human girls may be growing up too soon, but also has implications for laboratory animal care, veterinary medicine and agriculture, says Buddy Capuano, one of the study's authors and head of the center's Animal Services Division. 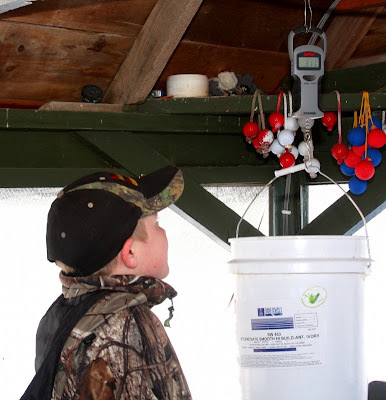 Capuano and his staff have been keeping a closer eye on how much sugar and fat center monkeys are getting to improve the overall health of the colony. Also working on the study were Kim Keen, a senior research specialist in Terasawa's lab, and Nicholas Shiel, an undergraduate student previously in the lab. There appears to be no limit to the nonsense from these people. They must genuinely think the public and the media are endlessly gullible. DAVID WAHLBERG. Wisconsin State Journal. January 31, 2012. I don't know whether this was actually written by Wahlberg (you can't tell any more because so many articles come from unnamed sources), but missing from it is mention of the widely published doubt by scientists without Kawaoka's and the university's financial interests in the continuance of the research, that information from the project would be of any benefit if a pandemic actually occurred. The reluctance to publish any condemnation of UW-based research has been very apparent in the paper's very spotty coverage of this internationally discussed story. 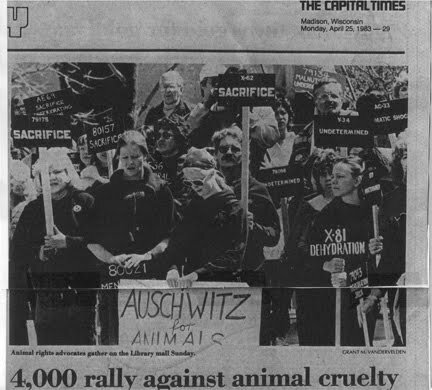 Of the myriad fronts on which the fight for animals’ rights is waged, antivivisection might be the one most associated with the use of logical, rational, science-based arguments. The vegan movement also employs science-based rationalistic health- and environment-related arguments, but pro-vegan literature seems more holistic overall. Science-based critiques and defenses of the use of animals as models of human disease and drug responses account for a large proportion of the pro- and anti-vivisectionist literature. I wonder though, whether those arguments, on either side, aren’t just so much smoke and self-deception. It seems to me that the real usually unspoken argument concerns the way humans treat other animals. The reasons we treat them badly aren't given much thought in actual practice. The arguments put forth to defend their poor treatment by us appear to be manifestations of our gene-based propensity to rationalize when confronted with a challenge. Quite matter-of-factly, hurting other animals is a human societal norm. We like to hurt and kill other animals. Seemingly rational arguments defending our behavior cannot be genuinely answered because they don’t accurately explain the behavior being challenged; they are mere rationalizations that shift as needed. It’s only recently that I’ve begun to understand this. There are good examples of our poor treatment of animals that can serve as anchor points for understanding why we ought not get too hung up with trying to carefully counter the claims made by those hurting animals when they are challenged to defend themselves. A careful rebuttal to an argument that doesn’t accurately describe real motivations is a waste of time, but worse, it leads one and observers to mistakenly believe that a better, more detailed, more fact-filled argument might have succeeded. Each two-person team had until noon to shoot as many squirrels as hunting regulations allow (five per hunter) and report to the Hyde Store in rural Iowa County for a weigh-in. The team with the heaviest bag would win the third annual event. I can imagine the rationalizations from the adult organizers and participants if they were challenged, but that’s all they would be, mere after-the-fact rationalizations. It would be ridiculous to spend a moment rebutting them because they would be shape-shifting inventions with no roots in reality. They simply like killing animals. Elephants used in circuses lead miserable lives. The documentation of their chronic poor health, life-long restraint, and physical punishment is voluminous. Yet, efforts to eliminate their exhibition are met with endless spurious claims. And their use continues. Simply put, we don’t care. We don’t care. Examples of our true opinions, our society-wide lack of concern about the suffering of literally billions of animals, abound. This brings me back to the arguments about the use of animals in science. They are shadow dances; they are the ever shifting meaningless shapes in a fog bank. The people presenting these vaporous defenses of animal experimentation eat animals. They wear their skins; they never speak on their behalf; they like seeing animals in zoos and circuses; and they enjoy killing them while hunting and fishing. They like using animals. Arguments over the utility of animal experimentation miss entirely the reason people do it. They like it. They get paid to do it. They don’t care about the animals. Their behavior is rooted in the societal norms that condone hurting and killing animals. We promote killing contests and cheer when animals are coerced into performing stupid tricks. We buy their flesh and dedicate magazines to the fashionable use of their skin and fur. We mount their dead heads on our walls. We use tax dollars to televise and celebrate hunting and killing them on public television. The notion that we have some well articulated rational reason for doing so, and that we wouldn’t if a better argument could be formulated, is untenable in the face of our daily unthinking use of them. .... Several research schools that don’t house chimps are also lobbying on the issue, fearing that other animals could someday be banned from research.